"After Brady Collins’ ex-wife dies, he receives devastating news—his nine-month-old son Sam isn’t his son at all. And Sam’s wealthy maternal grandparents want custody of the child. Brady knows he’s in for the fight of his life. But regardless of what any blood test says, Sam is his son, and Brady will go to any lengths to keep him. As Brady and Hope make sacrifices to help each other in their times of need, they risk uncovering a truth neither of them expects to find." The one thing I love about this program is discovering books and authors I normally would not have picked up normally. I previously reviewed a Denise Hunter book, and I fell in love. I ended up buying a ton of her work and she has become one of my favorite authors. I was so excited when I was able to get her newest work to review as well. I knew I would be reading it the day it showed up at my door, which is exactly what I did! This was a story about second chances which I love. I am not going to lie! I literally started this the night it showed up at my door, and I finished it by the next morning. She just has a way to pull you into a story, and make words flow with ease. 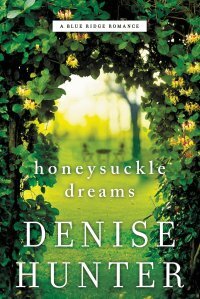 I am addicted to her work, and Honeysuckle Dreams was another amazing read. I did not even realize this was the second book in the Blue Ridge Romance series, as book one was my very first book by the author. I was excited to be back with some of the characters from book one. However; this can be read as a standalone as well. Overall, another amazing read from Denise Hunter and I will continue to pick up everything she puts out.